By Jennifer Bloom. 2008. Stipes Publishing. 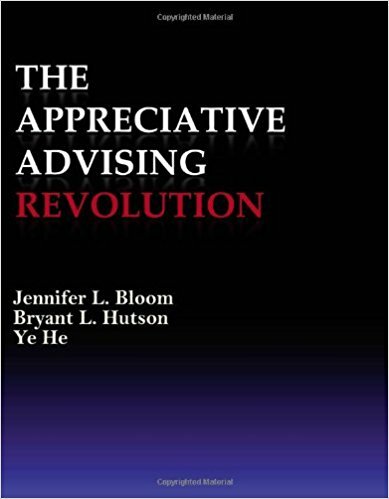 Appreciative Advising, a revolutionary academic advising philosophy, calls professional and faculty advisors to celebrate students' strengths as they help advisees achieve their life and academic goals. This user-friendly manual captures and explains in detail the six phases of Appreciative Advising (Disarm, Discover, Dream, Design, Deliver, and Don't Settle) as well as specific ways to intentionally incorporate them into advising sessions. In addition, descriptions of initiatives at the University of North Carolina at Greensboro highlight the successful implementation of Appreciative Advising into advising sessions and programs. Specific guidelines for implementing and assessing Appreciative Advising are also featured.